As the coils of economic development have tightened around the cities of Southern Xinjiang over the past dozen years, many Uyghur parents have increasingly found themselves without land, jobs and stable futures. In many cases the strain of existential insecurity is most sharply expressed in the lives of children. Kids who grow up in extreme poverty, speaking a minor language, are often left to fend for themselves as one or more of their parents leave to find odd and rare jobs in the city. 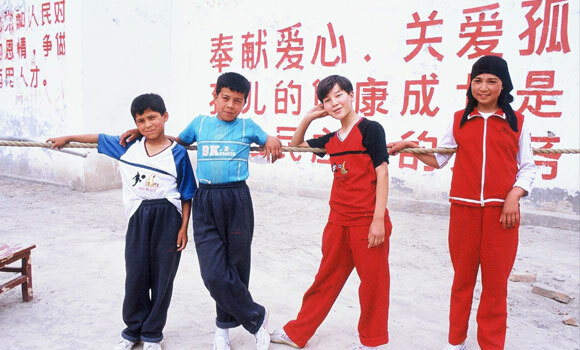 If they are lucky these kids will stay with grandparents or uncles, but in some cases particularly if a father dies or disappears these children end up in orphanages or, per a dominant stereotype regarding Uyghur children born in the “balinghou” generation, they will be forced to join gangs of roving pickpockets. Trinh Min Ha once wrote that a stereotype is an “arrested representation of a changing reality,” that is, they are stories which have an element of truth but don’t necessarily neatly match the lived experience of those they address. The charge of theft and deviance certainly has an effect on Uyghur kids (as this graphic video shows), but it doesn’t describe the complexity of what brings children to crime or to fame; nor do they describe the systemic violence which occurs when a person of privilege reviles a darker-skinned other. Interacting with prejudice teaches Uyghur kids that mainstream recognition will come through feats of the body in non-threatening arenas such as sports and theater, not the discipline of honest labor as an end in itself. Other paths to a successful life project — scientist, lawyer, professor, doctor, official, even, factory worker – often appear as unattainable or unattractive. Yet despite the many pitfalls that the circumstances of poverty effect on them some Uyghur kids survive and thrive; these “success stories,” in turn, inspire legions of young Uyghurs. 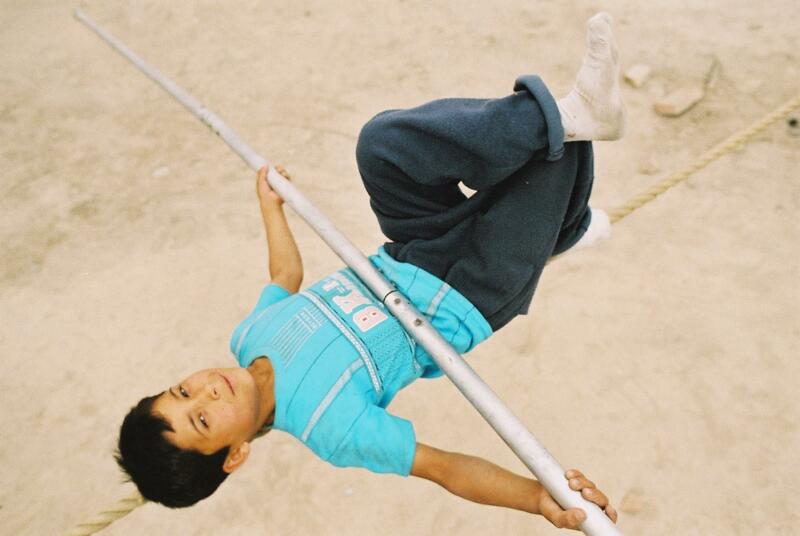 In this post I will discuss the 2007 documentary On a Tightrope and how the aspirations of Uyghur youth are channeled in particular directions. In On a Tightrope (Piraya Films, 71 min.) the Czech-Canadian documentarian Petr Lom follows the desires of four children who have been left in a state-run orphanage in Adil’s hometown. We see them follow local models of success; models which privilege heroic courage rather than intellectual prowess or the hard road of integrating with the Chinese mainstream. It is as though they were born already knowing the range of their lives: student, farmer, mother, singer, tightrope-walker. In the film, which is available in the U.S. for free via Snag Films and Hulu (see below), the children in the orphanage are taught by a contemporary of Adil the art of walking the wire. We see the children struggle to master the art, the way money is interwoven in their education, and the way the compassion which comes from living traditions rises to the fore as a first step in building confidence in their life path. The setting of the film is cold and hard. Crumbling concrete, faded propaganda slogans, and the hollowed out social world of forgotten towns on the margins of Chinese success dominate the scenes. Yet we hear and see snatches of changes on the horizon; the poverty of the place is a training ground for a future somewhere out beyond the haze; a future which never be more than a dream on the other side of the desert. The film shares a segment of the lives of four children: Sarigul, Ajimal, Hoji Abdulla and Jumakhun. We see them as they take their first steps on the rope; we see their resolve falter; we see them step up to challenges with preternatural confidence; we see them scrape out an existence for themselves. We also get a sense of what it takes to bring a traditional technique of the body like tightrope walking forward into the present: hard work. The orphanage is a harsh but comforting place. The harshness comes from poverty and politics not from ill will and abuse. It, like the Uyghur mosque and the Uyghur medicine clinic, is a place where difference does not supersede and dominate Uyghur individuals. Unlike so many Chinese institutions, the orphanage is a place where Uyghurs are free in their humanity and not assigned a category per the racism of ethnic stereotypes. Instead the orphanage is shown to be a place where the stories people tell, the traumas they experience, and the pain they feel is recognized. Even if the assistance the staff, the bullish tightrope walking instructor who fails to teach the children, and the old man who succeeds, is limited, misguided and, at times, unsafe, the place itself provides a feeling of home and rootedness – even as some of these children lose track of the graves of their parents. On a Tightrope is an excellent film. Although Lom’s camera does seem to love the iconic imagery of Mao and Marx and we hear quite a bit of the political rhetoric which suffuses daily life in Southern Xinjiang, in general his film counts on the intelligence of the viewer to sort out the politics, the feelings of extreme social marginalization, the force of economics, and the fragility of traditions. This attempt to hang back and let the action happen invites the viewer to enter into the experiences of these children as they speak for themselves. This approach encourages a feeling of radical empiricism: we feel as though the film shows us nothing more than experience but also nothing less. Although, of course, Lom has framed and orchestrated the story through the editing process, by putting us in the presence of these lives we are drawn to feel the raw strength of minority social positions and their effect on young lives. As I mentioned last week, following the release of the film, Adil has opened a multi-million dollar complex in Yengisar to train young tightrope walkers. 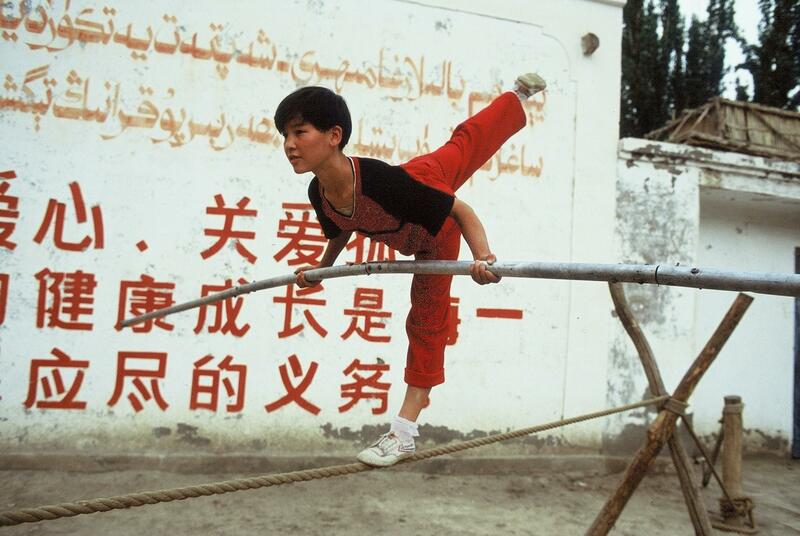 Two of the children featured in the film have since given up tightrope walking and were adopted by a generous professor in Urumchi; and if the rumours hold true, they have received scholarships to study at prestigious Western universities.